Jacob Bromwell Popcorn Popper Giveaway! 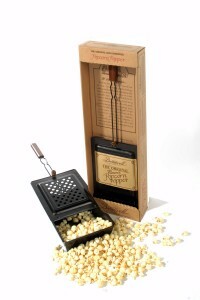 I am pleased to have been contacted by Jacob Bromwell with the offer of one of their great popcorn poppers, to be given away to a lucky Vintage Powder Room reader! Jacob Bromwell has been around since 1819 — so they definitely qualify as vintage. Next to finding a vintage face powder in mint condition, I adore sitting with my feet up, snacking on freshly popped corn, watching a classic movie or reading. Because I’m not a camper, I’ll use my popper in my living room fireplace. I have to confess that my idea of communing with nature is watching a documentary on the National Geographic Channel. For those of you who spend warm summer nights under a starry sky having one too many S’Mores around a campfire, this fabulous popper will help you to make a healthier choice. If you would like to enter the drawing, please email me at: joan@vintagepowderroom.com with your name and shipping address (the giveaway is open to U.S. residents only). One winner will be drawn at random. The contest ends Monday, August 8, 2011, at 12 noon PDT.